HL Series, Intermodal Power Connectors - Eastern Connector Specialty Corp.
Eastern Connector carries the Pyle-National HL Series connectors from Kitazawa Electric Works (KEW). These intermodal power connectors are applicable throught the world in refer applications and comply with International Standards Organization (ISO) and CEE Standards. The HL Series consists of Interlocked Receptacles in single, two & four gang units. Also included are panel mount receptacles, plugs & inline cord connectors. These products operate reliably in climate extremes and are made of non-corrosive materials. Interlocked receptacle is dead front for safe electrical connection. To ensure fluids are kept out of interior, plug and cord connectors are provided with o-ring seals on the contacts and insulator. Also, their is a tapered ruber gland at the cable entrance. Pre-wired interior permits fast & cost-saving installation. Constructed of corrosion resistant materials for durability and longevity. Captive screw-on dust cap protects receptacle from weather when plug is not engaged. Contacts terminate with pressure screw wire connections for fast installation and easy maintenance. “Self-Wiping” contacts made of high strength copper providing supieror conductivity and corrosion resistance especially in marine environments. Grounded contacts are longer than phase contacts for first make/last break safety. 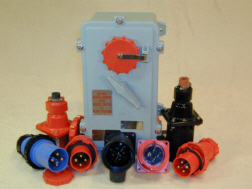 Interlocked receptacle enclosures and panel mount receptacles are both equipped with gasket for weather tightness. Panel mount receptacles, plugs and cord connectors are constructed of non-metallic material for long life and safety. Plugs and cord connectors are equipped with mechanical clamp to provide cable strain relief. All enclosures are MET listed.